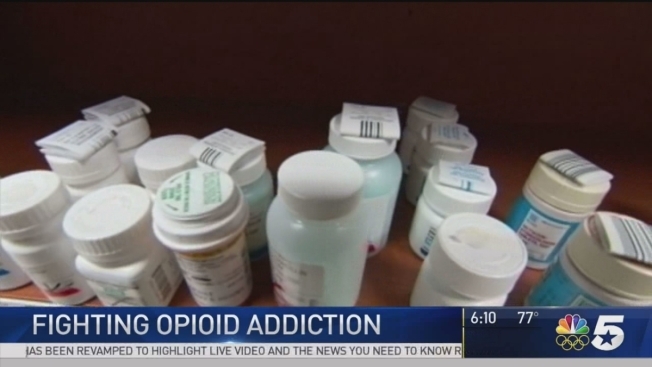 More than 1,000 people a day are rushed to the emergency room for opioid abuse, according to the Center for Disease Control and Prevention. Prescription drug abuse is wide spread, and an epidemic that is widespread throughout the country. "Every day 45 people will die from an opioid overdose," said Christina Hareison, pharmacist at a Walgreens in Dallas. "That is why Walgreens wants to combat this issue. It's impacting a lot of people and a lot of households," she added. Prescription opioids are classified as painkillers, such as hydrocodone, oxycodone, morphine, codeine, methadone and fentanyl. Heroin is also classified as an opioid. People who suffer from chronic pain, or are struggle with an opioid addiction have the greatest risk of overdosing. "When someone has overdosed, their breathing response gets less and less, and as their breathing gets less and less it has an effect on their cardio vascular system overall," said Dr. Jim D'Etienne, chair of emergency medicine at Baylor University Medical Center. "When those patients come to the emergency rooms, doctors use Naloxone to reverse those effects and start their breathing again," he said. Emergency room doctors have used the anti-opioid overdose medication Naloxone for years, but now the medication will be available for purchase without a prescription in 700 Walgreens stores across Texas. "The medication can come in three different forms. The vile – that you use with a syringe – the auto-injector, or a nasal spray," said Hareison. The "auto-injector," which is administered like an EpiPen, is easier to inject, and Naloxone will react within two minutes. The nasal spray will take 8-11 minutes to take an effect. "Naloxone still doesn't take the place of medical help. Just because the person starts breathing again, that doesn't mean they are in the clear. It will just buy you time to get them to the hospital. Anyone who knows someone struggle with opioid abuse should have Naloxone on hand," said D'Etienne. "My concern is saving lives. If someone has this and they are aware enough and are a potential risk, then it's good for them to have it available. This could save their life," he said. Walgreens stores in 35 states will soon have Naloxone behind the pharmacy counter for purchase without a prescription.